Rose Metal Press has done it again! Family Resemblance, edited by Marcela Sulak and Jaqueline Kolosov, is not only an exceptional tool for the craft, but also a vivid example of the craft. In much the same style as their Field Guides to Flash Fiction, the Prose Poem, and Flash Nonfiction, Family Resemblance brings us craft essays from 43 different authors, and then also gives us gorgeous examples of the forms. The hybrid is defined and showcased here, but without any futile attempt to cage or confine it. 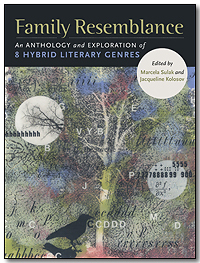 The anthology covers 8 hybrid forms–the lyric essay, the epistolary, the poetic memoir, prose poetry (my favorite), performative, short-form nonfiction, flash fiction, and pictures made of words. And whether you want to learn more about the different creative forms, or just enjoy reading them, you’ll find plenty here to love. I have a huge crush on all things hybrid and experimental because I like the tangible, textural feel of those pieces, and I find myself gravitating toward the edgy kind of journals that publish it–journals like Threadcount, Rivet, theEEL, and DIAGRAM. And Family Resemblance has allowed me to take a closer look at these forms that inspire me. If you like that kind of work as much as I do, you are going to cherish and appreciate Family Resemblance. Go grab a copy now! Huge thanks to Rose Metal Press for sending me a review copy of Family Resemblance–I shall hold it close forever!